ZCD Side Dumping Rock LoaderDescription of ZCD Side Dumping Rock Loader: ZCD60R, ZCD80R, ZCD100R side dumping rock loaders are driven directly by electrical machine. Continuous tracks are used when these series machine work. The operation is supported by hydrocylinder. The bucket is equipped with side dumping mucking loading device. Therefore, these ZCD60R, ZCD80R, ZCD100R side dumping rock loaders feature safety, large force, well flexibility, etc. ZMCY45R, ZMCY60R Side Dumping Rock Loader for Coal MineDescription of ZMCY45R, ZMCY60R Side Dumping Rock Loader for Coal Mine: This series rock loader for coal mine is new crawler loading device without track. ZMCY45R, ZMCY60R side dumping rock loader for coal mine can work in coal gangway, semi mine-coal gangway, light section rock gangway, etc. In addition to being a loading device, coal mining side-type rock loader can provide the power for hydraulic dilling tool. This mucking loading machine has the advantages of well flexibility and stability, high productivity, etc. 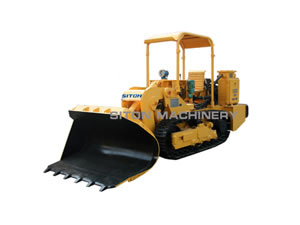 This rock loader in our company can be divided into electric rock loader and crawler side dumping rock loader. This loading device is wide used in home and aboard. 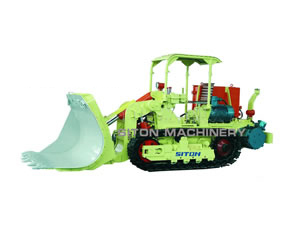 The structure of rail-mounted rock loader is similar to wheel rock loader with rock bucket. It can be used in underground tunnel for geological prospecting. When working, the body of this wheel rock loader with rock bucket goes forward first, then the bucket falls into the rock heap. Following, the bucket of mining mucking rock loader is risen and the body of this rocking loading machine will draw back. Finally, the rock pile in the bucket will be put into the mine car or other transshipment vehicle.